The Tower Theatre Foundation’s exclusive series of concert and behind-the-scenes documentaries on renowned rock music performers continues in November with a tribute to guitar god Jimi Hendrix. Hendrix 70: Live at Woodstock takes the silver stage Monday, November 25. To commemorate Jimi Hendrix’s 70th birthday, the special presentation of his unforgettable August 1969 Woodstock concert features Voodoo Child, Fire, Purple Haze and Foxy Lady plus Hendrix’s dramatic interpretation of the Star Spangled Banner. The film opens with a fascinating “road to Woodstock” documentary revealing the struggle to stage the legendary festival and secure Hendrix as its headline artist. 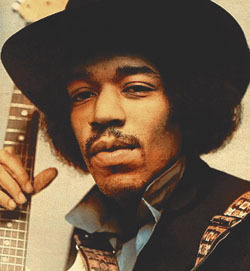 Hendrix 70 features digitally restored original 16mm footage, with audio re-mixed by Hendrix’s own recording engineer, Eddie Kramer.